Just asking all my prayer warriors to pray for Hollis- he has had a difficult morning and is in that stabley unstable dance. He coded this morning, but they were able to bring him back on he is now on the oscilating ventilator. Still trying to avoid ECMO. Please hold him and his family in your prayers. Also wanted to share a photo from our recent Casual Camera Photography session – Michelle is awesome!! Love this photo of my peanut! 5:55 PM – they are preparing to put Hollis on ECMO – please pray!! Rolling over! Mama bragging time…. Just a quick update because we had a home nurse visit today and Finley got weighed- she is 12lbs 6.5 oz and 24in long! And she rolled over 3 times today from her stomach to her back! She had been working on her back to her front lately and today when the nurse was here she just busted out and rolled for her three times the other way. The nurse said that if she hadn’t had known about Finley’s condition in advance she would never had guessed that she had been through such a major trauma given how well Finley looks and how she is even a bit advanced developmentally. We have our first developmental follow up with Emanuel on December 17th so we will see “officially” how Finley is doing for her 4 month milestones. Author lizdooleyPosted on November 26, 2010 Categories Uncategorized1 Comment on Rolling over! Mama bragging time…. Words cannot express the extreme gratitude and thankfulness I feel today and everyday. I am thankful for beautiful Finley and the complete miracle that she is. I am thankful for all the doctors, nurses, and medical personnel at Emanuel that cared for Finley during her 49 days. I am thankful for Dr Bliss and his talent. I am thankful for my husband and my daughter Rowan. I am thankful for our friends and family that loved, supported, and prayed for us. I am thankful to those that ran errands, brought food, and sent messages to us throughout those long days of waiting. I am thankful for our jobs, our home, and the food in our cupboards. I am thankful to God for his faithfulness, his love and protection, and answered prayers. I am thankful for our story and the ability to be there for others. I am a changed person for this experience (I think in a good way). We are thankful for all of you. Enjoy your Thanksgiving!! I know we will. Turducken, Stuffing, Mashed Potatoes and Gravy, Asparagus, Caesar Salad – and Chocolate Mousse for dessert.. I think it’s time to wake Rowan up so we can start eating! Author lizdooleyPosted on November 25, 2010 Categories UncategorizedLeave a comment on Happy Thanksgiving!!! Finley had some appointments today. First at 11:00 we had a abdominal ultrasound to check up on her gall bladder and bile duct. Last time the gall bladder was enlarged and distended – this time the guy had trouble even finding it. He had to call in the Radiologist to confirm if he had the right body part. The bile duct was slightly larger than last time, but Dr B said it is only slightly larger than a normal size, so he wasn’t concerned. The Ultrasound took over an hour because Miss Wiggleworm would not lay still for her photos and kept kicking the tech in the hand. Ran into Dr Bliss in the atrium and said our goodbyes -still hate that he is moving, but Finley’s fate doesn’t lay in the hands of any one man. I just try to think about all the lives he will help in LA. 1:00 we met with Dr Cheng, Finley’s cardiologist (How weird is it that my 12 week old has a cardiologist and neither Jon nor I have one?). After checking her blood oxygen (98-100) and getting some of her vitals, she got another EKG. No evidence of any pulmonary hypertension – everything looked good! She had one area that required a second look – but Dr Cheng thinks it is just artifact. The he told us that he doesn’t need to see Finley again unless she shows symptoms of having PT issues (lethargy, turning blue, difficulty breathing, difficulty feeding). How awesome is that? He said how rare it is for him to see a baby that required as much intervention as Finley did doing THIS well so soon. What can I say, but thank you God, thank you God, thank you God! I know how blessed Finley and we are. I know I have heard from several expecting moms saying that our blog gives them hope – and I am so thankful for that. I remember clinging to the survivor blogs when I was pregnant and I know how much comfort it gives to read about the babies doing well. I have heard the comment about how strong we were, but I hope everyone realizes that whatever strength and hope you saw in me- that was God. My nature is entirely different. I was able to sleep through the night pretty much every night from the diagnosis on. I never had a nightmare. I had fear – don’t think for a second I didn’t. But I felt God in a very real way through this journey. If you are a family going through a poor fetal diagnosis – know God will be there every step of the way with you. Always feel free to each out to me.. I hope to be able to help others through this journey, as some very special people have helped me. P.S. AND good weight gain this time! 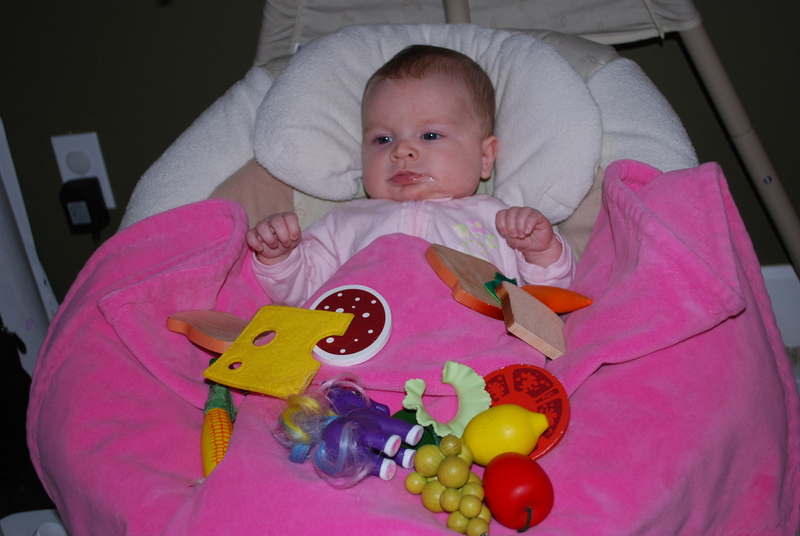 Almost an ounce a day – she is now 11 lbs, 15.9 oz – so by tomorrow she will be 12 pounds!! Happy 3 month Birthday Finley! Finley is 3 months old today. Happy 3 month Birthday to my beautiful baby!! It brings tears to my eyes looking back at the past few months and remembering how far we have come. I am just so thankful and feel so blessed to have this amazing baby home with us. You look at her today and would have no idea of what her first 7 weeks were like. She is doing really well on her feeding and weight gain- except for last week, but I tried another reflux medicine and found out that the Prilosec really does work best. I am hoping she will break the 12 pound mark by next Wednesdays weight check (She was 11.7 last Monday). Please keep praying that she continues to gain weight so well. I am so very thankful for this since I know this is NOT typical for CDH babies. I was reflecting a lot about our journey yesterday after receiving the news that our beloved surgeon is moving down to California. Maybe this is God telling us that we won’t need him again and he has done what we needed. Finley is such a happy baby. Mostly mellow unless she is hungry or tired. She smiles so much. And what a talker- she loves to coo and ga. She is just like Rowan in that she loves to be held and that is her favorite place to sleep. I think she is as happy as we are to have her home with us. It’s been 6 weeks – we are close to passing the amount of time she was in the NICU. What a happy day it will be when she will have spent more time at home with us, than in a hospital. My heart is overflowing with happiness for Finley and our family, but breaking today for another CDH family – Christopher ‘Heath” has passed. He survived his surgery and made it home within a month and was home about a month and then contracted RSV and has died today due to CDH complications with the RSV virus. It just reminds me (again) that each day is SUCH a gift. It also reminds me why I need to be so vigilant to try and keep Finley healthy, but I know that I can only do so much. I know her life is ultimately in God’s hands and as another NICU mom put it – she is just on loan to me. Some recent Finley photos… thank you for your continued prayers for Finley and I ask for you to pray for Heath’s family as well. For only being in the 35% – I sure have some chubby cheeks! 3 month Birthday shot – new fav! Author lizdooleyPosted on November 12, 2010 Categories Uncategorized3 Comments on Happy 3 month Birthday Finley!